Gads Hill Center, a social service organization that creates opportunities for children and their families to build a better life, is the recipient of this year’s $100,000 Humana Communities Benefit grant in Chicago, which is funded by the Humana Foundation, the philanthropic arm of Humana Inc. (NYSE: HUM). To encourage exercise and promote healthy habits among children and adults living in Pilsen and Chicago’s southwest side communities, Gads Hill Center will utilize the $100,000 Humana grant to launch the Healthy Lifestyles project. “Thanks to the generous funding from Humana Communities Benefit, we will finally be able to transform our gym into a facility that will benefit community members of all ages,” said Maricela Garcia, Chief Executive Officer, Gads Hill Center. For the 11th consecutive year, the Humana Communities Benefit program in Chicago has afforded a local 501(c)(3) nonprofit organization the opportunity to receive a one-time $100,000 grant to create new programs or enhance ongoing activities that have a positive transformational impact on the organization and the community. “The proposal from Gads Hill Center shared the Humana Communities Benefit mission of improving health experiences and building healthy communities,” said Praveen Thadani, president of Humana of Illinois. 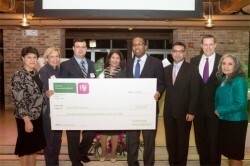 For more information on the Humana Communities Benefit program in Chicago, visit www.Humana.com/HCB.